The Small Cap Mid Cap Stocks are one of the best investment bet for future. These stocks are the first choice of aggressive stock market investors. In last few years midcap and smallcap index has given a magnificent performance and outperformed BSE Sensex. It is but natural that midcap and smallcap companies have good scope when it comes to product portfolio and future expansion. These type of stocks are candidates to become the multi-bagger stock in the future. Investors are always hunting for good Small Cap and Mid Cap stocks for investment. 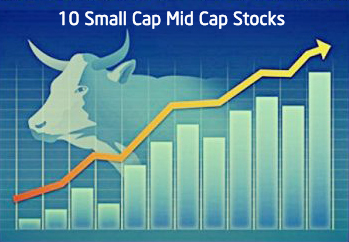 In order to help them here are 10 Small Cap a suggested by Stock Market Experts. Before starting actual talk let’s take a look at few top mid & smallcap stocks that have given very good return to the investor in past. 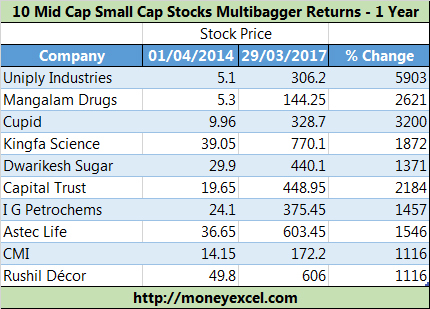 Based on above historical performance of small cap and mid cap stocks you must be convinced that small cap mid cap can give multi fold returns. Now let’s take a look at 10 Small Cap Mid Cap Stocks by Stock Market Experts. GNFC is one of the favorite stock of Dolly Khanna aka Rajiv Khanna. GNFC is in the monopoly business of manufacturing of TDI (toluene diisocyanate). This chemical has wide application in a number of industries. The recent anti-dumping duty on TDI will surely help GNFC to strengthen its position in Market. A quarterly performance of this stock is very good. A company is expected to become debt free by 2018. One can purchase this stock with a target of Rs.450. Trident is another favorite stock of Dolly Khanna. Trident is in home textile and paper segment business. Trident is one of the key beneficiaries of the Welspun India fiasco. Trident is on a growth trajectory and started increasing capacity. Valuation of this stock is reasonable. You can plan to invest in this stock. Mannapuram Finance is Dolly Khanna’s top stock pick. Manappuram Finance is in the finance, leasing & hire purchase sector. This company gives loan against physical gold. The increase in profitability, stability in gold price, and financial performance are positive sides for this stock. The valuation of the stock is reasonable. The growth story of Manappuram Finance is expected to continue in future. Rain Industries is next mid cap stock for investment. Rain Industries is engaged in the business of manufacture and sale of carbon products, chemicals, and cement. The valuation of the stock is attractive. The financial performance of the company is improving. The company is taking active steps to manage is debt liability by refinancing at lower interest rate. Tata Global is one of the favorite stock of Porinju Veliyath. Tata Global is fail safe risk free stock for investment. The company is backed by Tata group. The stock is available at a cheap valuation and likely to deliver multi-bagger return for the investors. It is very good stock for investment in mid cap segment. Cimmco is next stock of smallcap czar Porinju Veliyath. Cimmco is engaged in manufacturing and selling wagons and engineering goods including machinery, raw material and cement., Cimmco also offers a range of services from concept to commissioning for industrial plants. A company’s financial performance is improved compared to last year. Titagarh Wagons is one of the favorite stock by Porinju Veliyath. Titagarh Wagons is in the business of making wagons, bridges and heavy earth moving equipment. Looking at upcoming metro train projects in multiple cities this company is expected to get very good business. Strong fundamentals and the healthy order book is a positive side of Titagarh Wagons. Vaibhav Global is one of the favorite stock of Vijay Kedia. Vaibhav Global is small cap e-commerce diamond company. A company is engaged in manufacturing and exporting jewelry, color gems stones, precious and semi-precious stones and studded jewelry. A major business of Vaibhav Global is in the USA but company is listed on BSE. The financial performance of company is very good. One can plan to invest in this stock. TCPL Packaging is another recommended stock by Vijay Kedia. TCPL is the leader in paper board packaging. TCPL has competitive advantages. It has setup packaging factories closer to the manufacturing facilities of its key customers. This has helped to reduce costs. TCPL financial performance is very good. A Valuation of TCPL is reasonable. TCPL is expected to give multi-bagger gains in foreseeable future. Vijay Kedia’s favorite high conviction stock is Karnataka Bank. Vijay Kedia called this stock as “sitting duck multi-bagger”. Karnataka Bank as it is the most technology savvy private sector bank. The valuation of the stock is very low. The bank has projected to double its turn over by 2020 & started working towards that. The bank is accelerating branch addition and boosting financial performance. Thus Karnataka Bank is a good stock for investment. 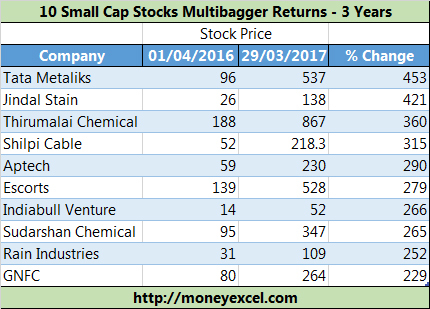 What is your take on these Small Cap Mid Cap stocks? Do you think these Small Cap Mid Cap stocks will able to give good returns in the future? These stocks have been recommended by Stock Market Experts, what is your personal view/opinion on these stocks?? All are good stocks. Risk is minimum. Titagarh is divrsifid company where as Himalaya Brand of Tata Global in USA market will bust share price. Nice scripts selection. Thanks for providing insight for investment, in this present turbulent market!